The Bell 206 is a light helicopter. It was designed and built in the United States by Bell Helicopters. It was originally designed for civilian purposes. It was changed to be used by the military, including the US Army. It first flew in December 1962. Its manufacturing stopped in 2010. Licence-built were occurred to Italian company Agusta. Bell 206 is 39.8½ feet (12.11 meters) long, 33.4 feet (10.16 meters) diameter, and 9.4½ feet (10.96 meters) tall. A minimum mass that weighs 1 713 pounds (777 kg) and at the maximum mass that weighs 3 200 pounds (1 451 kg). It's powered by an Allison 250's engine driving a helicopter rotor with two blades. Agusta-Bell 206A, license-built in Italy. Agusta-Bell 206A-1, license-built in Italy. Agusta-Bell 206B, license-built in Italy. Agusta-Bell 206L, license-built in Italy. Agusta-Bell 206L-1, license-built in Italy. Agusta-Bell 206L-3, license-built in Italy. Bell TH-57A, B, C, D Sea Ranger : Training military variant built for US Navy and US Marines Corps. Bell OH-58A, B, C Kiowa : Observation and militaries light liaisons variant built for US Army. Bell OH-58D Kiowa Warrior : Observation and light attack variant built for US Army. Bell TH-67A : Training military variant built for US Army. Bell CH-139 : Mulit-purpose military variant of Bell 206B-3 built for Canada. The Bell 206 is a very popular helicopter and was sold in many countries in the world, particularly in USA, Canada, and in Europe. 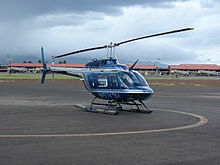 ↑ "Bell Helicopter Bell 206 JetRanger - Specifications - Technical Data / Description". www.flugzeuginfo.net. ↑ "Bell 206A "Jet Ranger" / OH-58 "Kiowa" helicopter - development history, photos, technical data". www.aviastar.org. ↑ "Bell 206 / YOH-4A helicopter - development history, photos, technical data". www.aviastar.org. ↑ "Bell 206 407 427 429". Helis.com. 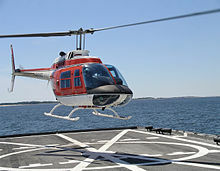 ↑ "Bell 206L "Long Ranger" helicopter - development history, photos, technical data". www.aviastar.org.